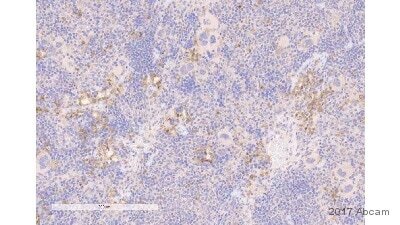 ab36827 was raised against a 14 amino acid peptide from near the carboxy terminus of CCR3 (Human). Our Abpromise guarantee covers the use of ab36827 in the following tested applications. WB Use a concentration of 1 - 2 µg/ml. Detects a band of approximately 55 kDa (predicted molecular weight: 43 kDa). 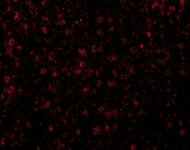 Immunofluorescence of CCR3 in Human Spleen cells using ab36827 at 20 ug/ml. Publishing research using ab36827? Please let us know so that we can cite the reference in this datasheet. Bitte nennen Sie mir Preis, Frachtkosten und Lieferzeit. 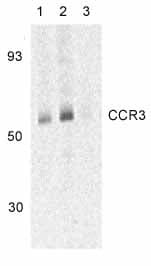 Könnten Sie mir bitte noch mitteilen,mitwelchenCCR3 Polyclonal Antibody Sie den ab36827 vergleichen möchten, da wir eine sehr große Auswahl an polyklonalen Antikörpern haben? Weare interested inCCR3(36827)to knowthat are tested and guaranteed for WB, it´s enough to place an order. Because we are having problems with this one from another company. I am happy to confirm that ab36827 is tested and guaranteed by our Abpromise to work in WB with human, mouse and rat samples. 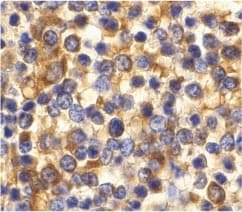 I can suggest to run a positive control (Human spleen cell lysate) along with your samples. Please feel free to contact me again with any further questions.